The dance world seems to be awash with contemporary costumes consisting of a crop-top, dance pants and an attached skirt. So it’s a delight when I’m asked to make something that varies from the trend. This one piece costume is a gorgeous midnight blue with black appliques and crystal AB rhinestones. What I love about this Jalie pattern is the yoke and sleeves are one piece so there are no seams in the mesh to distract from the dancer’s line. And the back has a nice deep keyhole for some added interest. I’m looking forward to using this pattern again. 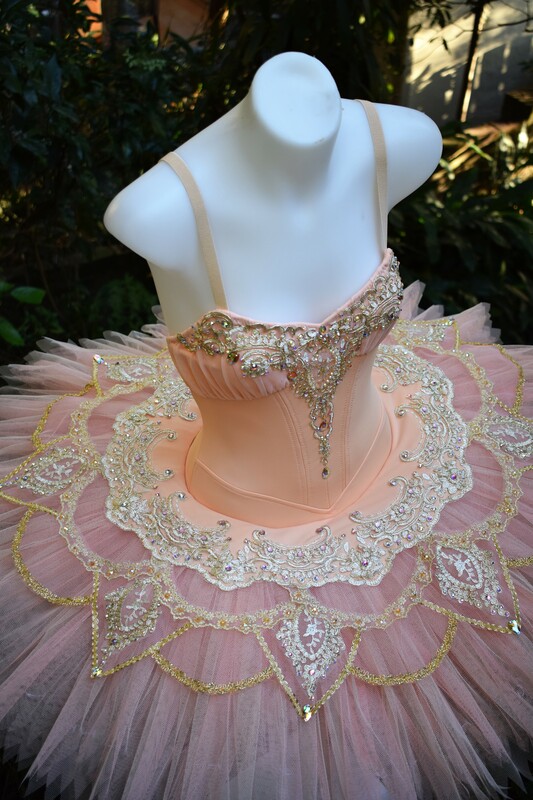 My last multiple post will be those enduring colours of the ballet world, white, ivory and apricot. 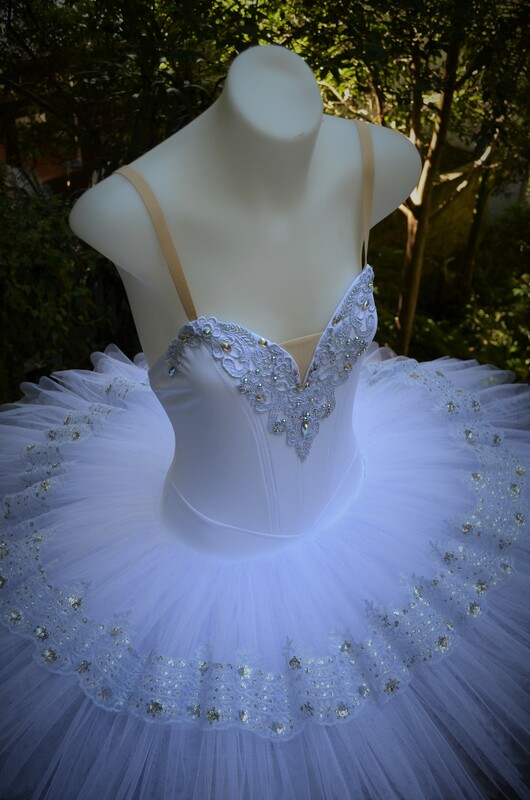 A lovely white tutu with silver venise lace, crystal AB rhinestones and a simple overlay of silver white lace. This design took a lot of to-ing and fro-ing but I think my client and I came up with a real winner. 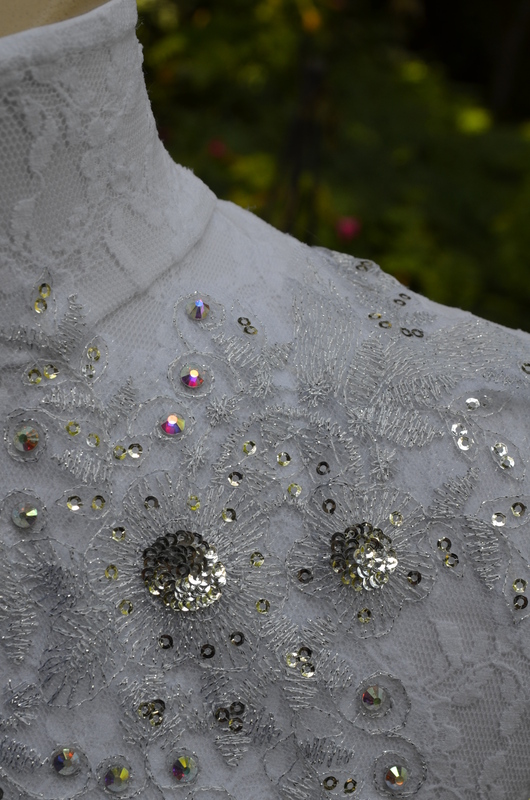 Silver venise lace and crystal AB rhinestones again team beautifully with crisp white. The ruched bodice and underbust decorations are now one of my favourite designs. This lovely Paquita made her debut at the Sydney Eisteddfod this year. The ivory particularly suited the young dancer’s olive complexion. 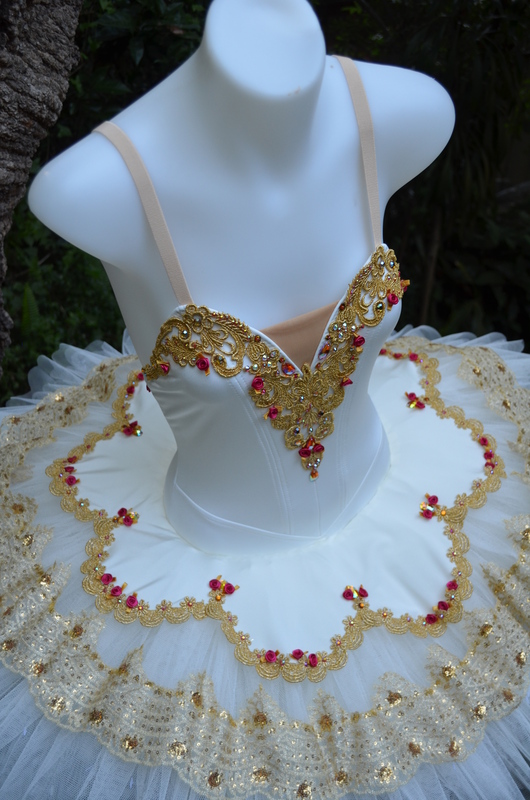 The ornate geometry of the decorations gave a baroque feel to this tutu. The skirt was a mixture of white and ivory to reduce the starkness of an all white skirt. I know I shouldn’t have favourites amongst my “children” but this beauty still takes my breath away. 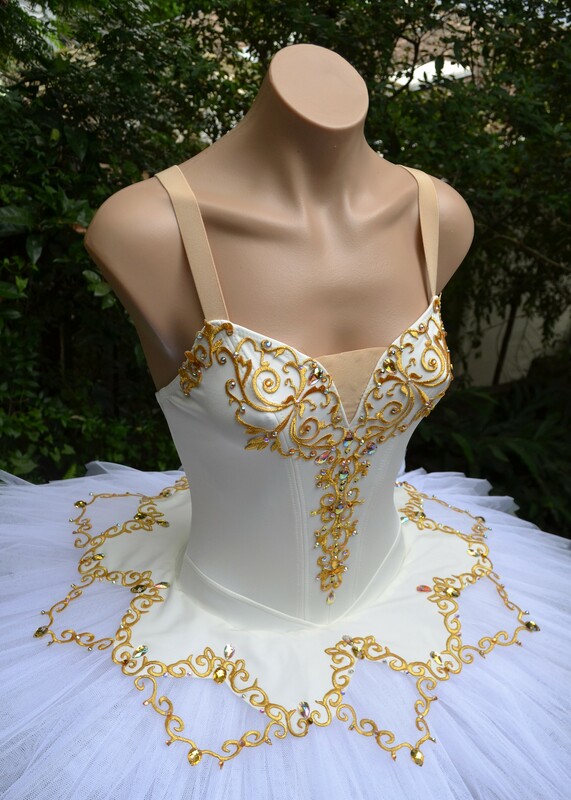 The upper bodice is covered in stretch lace and the decorations are a combination of apricot, copper and gold. There is a single layer of apricot net that gives the skirt a pretty blush. And this tutu is the very close second. It’s pretty and romantic. I had great fun constructing the ornate plate. Finding lace and trimmings for costumes is a never-ending task; EBay, Aliexpress, op-shops, generous gifts all make for a lively versatile inventory. But sometimes you can get stuck. 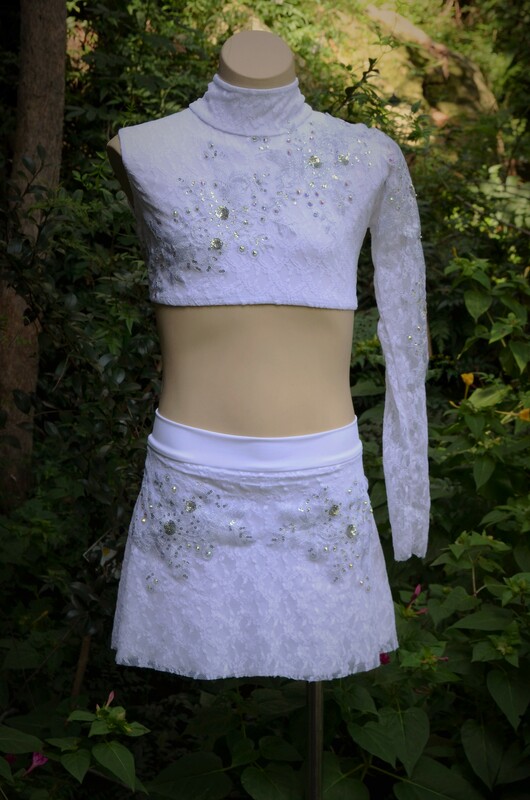 Well here’s how I used white and silver in three different ways – not because I’d run out of ideas but because 3 separate clients all chose similar pretty lace for white lyrical costumes. This lace is readily available from Spotlight stores on Australia and New Zealand. It’s quite versatile but is becoming a little overused. So circumstances call for some creativity to reinvent this useful fabric. In the picture above it is overlaid on knitted lace and has a few rhinestones added. 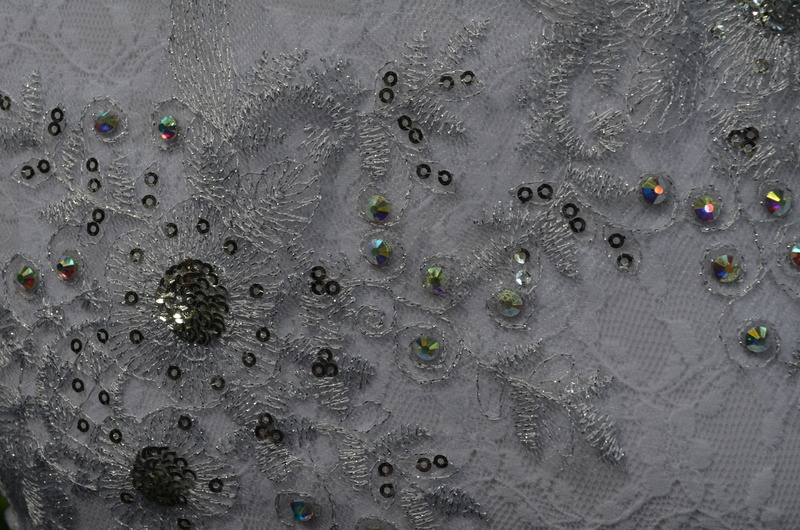 In the first costume the motifs from the lace were blinged up with crystal AB rhinestones and used to decorate the skirt and bodice of the costume. The sequin lace blends beautifully into the lycra/stretch lace combo. 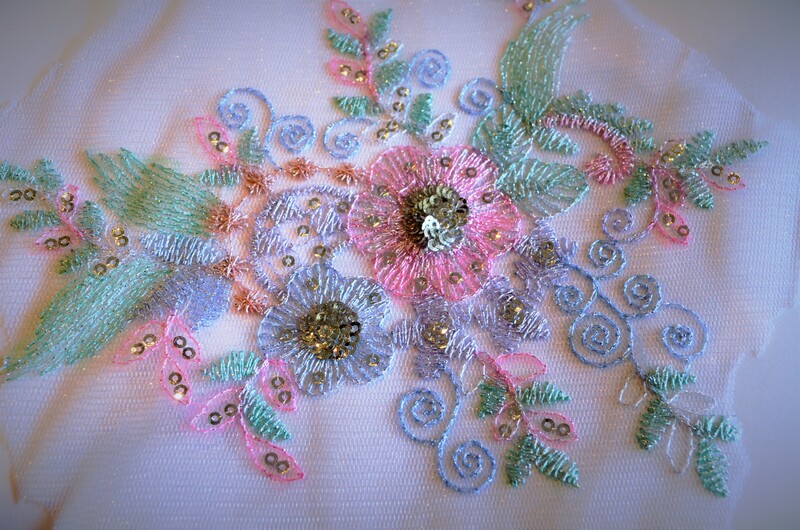 The lace motifs are continued around the back of the bodice and onto the lace sleeve. 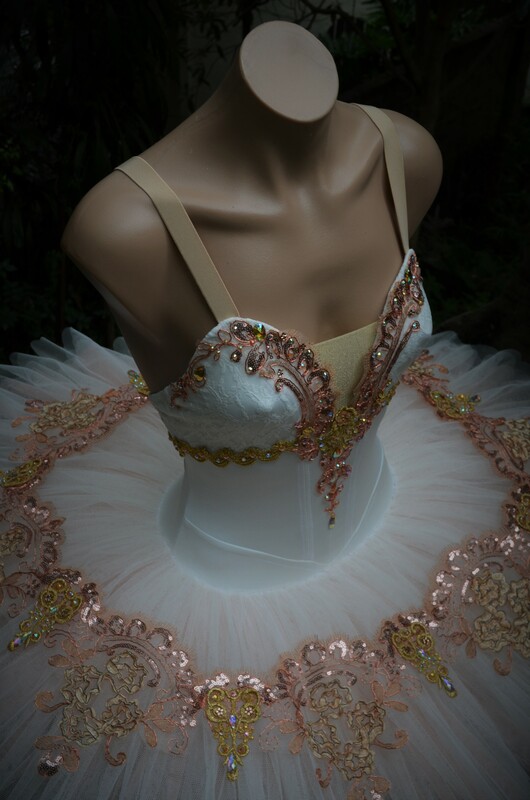 This is a lovely simple costume for a young dancer. The current trend for bare midriff is included but with plenty of coverage elsewhere. 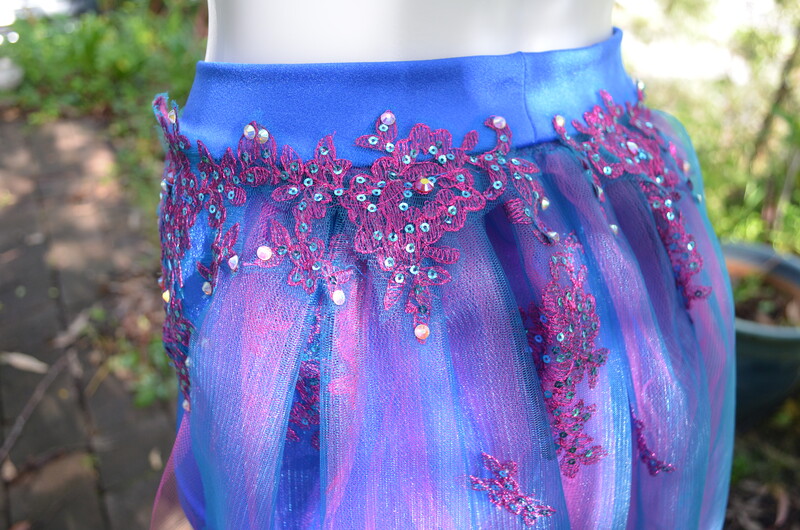 The second costume is a lyrical with a long stretch mesh skirt. 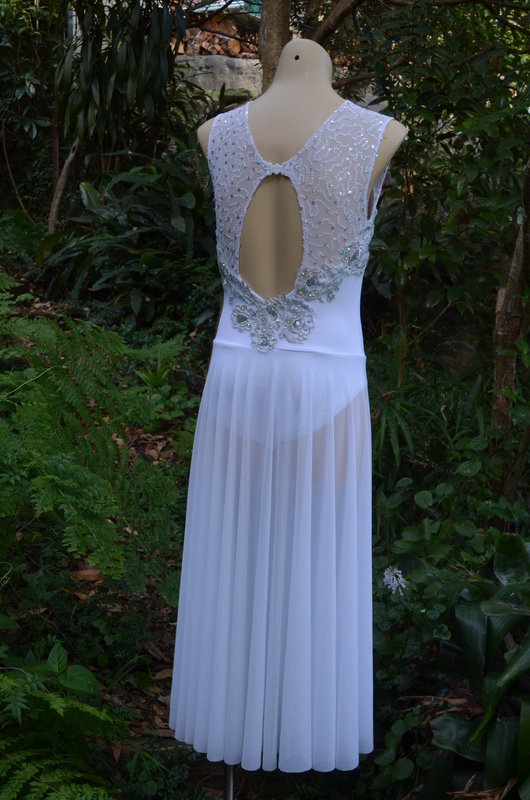 In this case the a corded silver lace covers the seam between the lycra and the white sequin mesh on the upper bodice. I’ve condensed space between the motifs to give a more solid silvery effect. The Spotlight lace could easily have been used here as well with a similar effect. 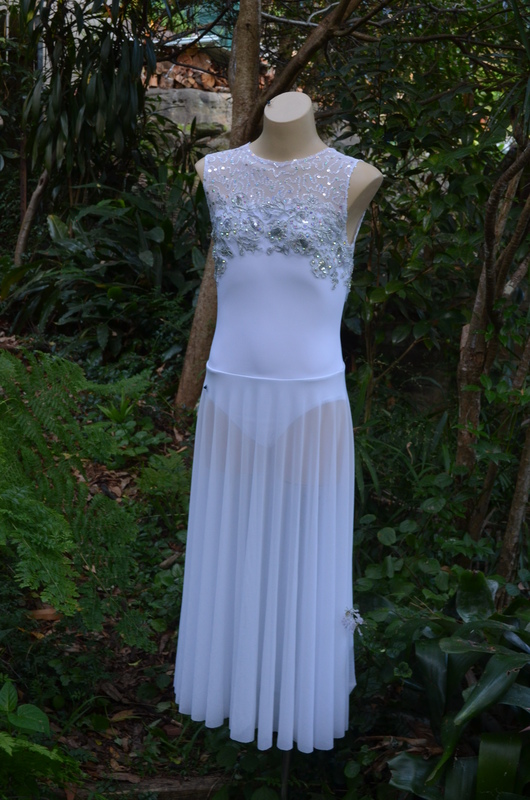 The addition of the corded lace over the seam between the lycra and the white sequin mesh gives the impression of a more complex lace fabric overall. The final white costume required soft pastel colours so I thought a bit of hand painting might work well. 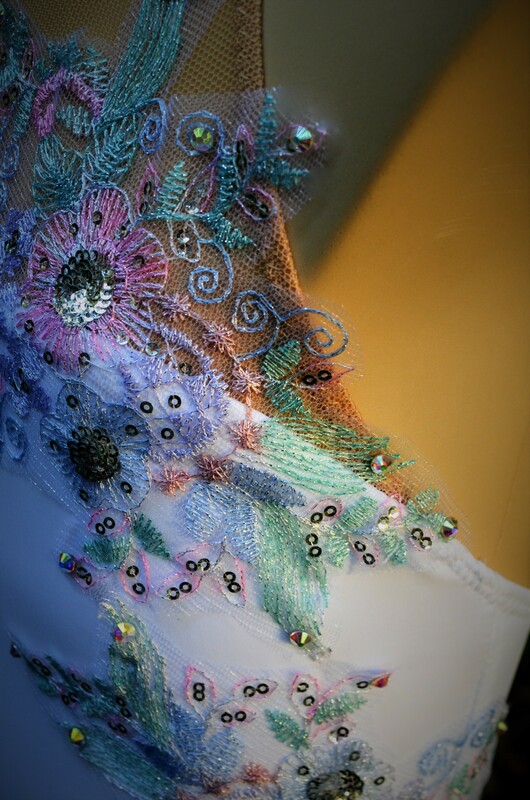 You can see this is the same lace that was used in the first costume. The apliques were placed on the bodice and continued around onto the back of the skirt. While the colours look a little bright here, under stage lights they fade to lovely soft shades. And below is the finished costume. So you can see there are plenty of options for creating white and silver costumes. 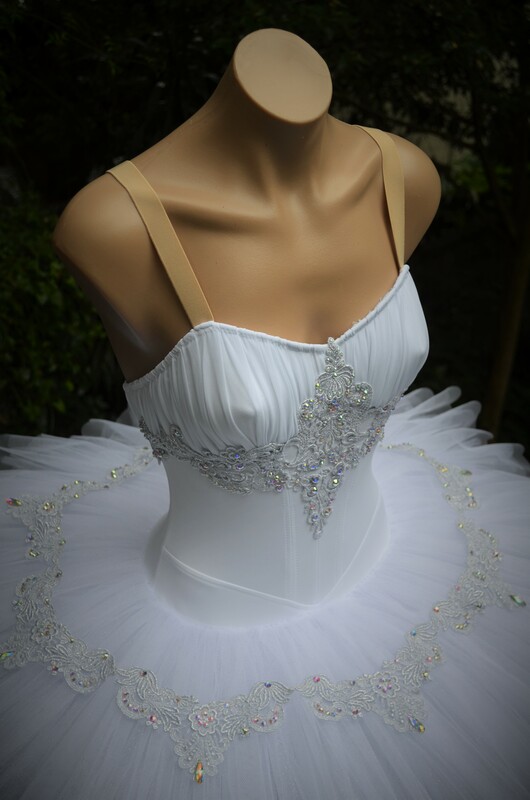 This contemporary costume is a beautiful and elegant combination of charcoal lycra and cream stretch mesh with a splash of crystal AB rhinestones. 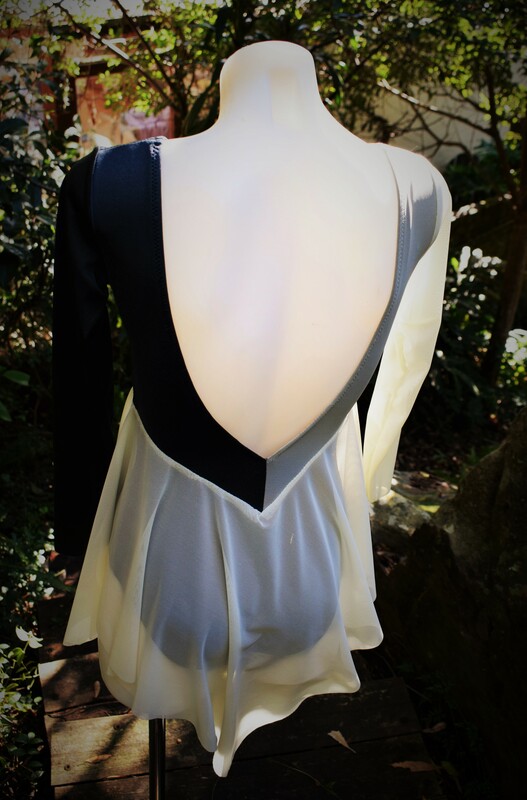 The leotard was made up in charcoal lycra with a cream stretch mesh empire line skirt. 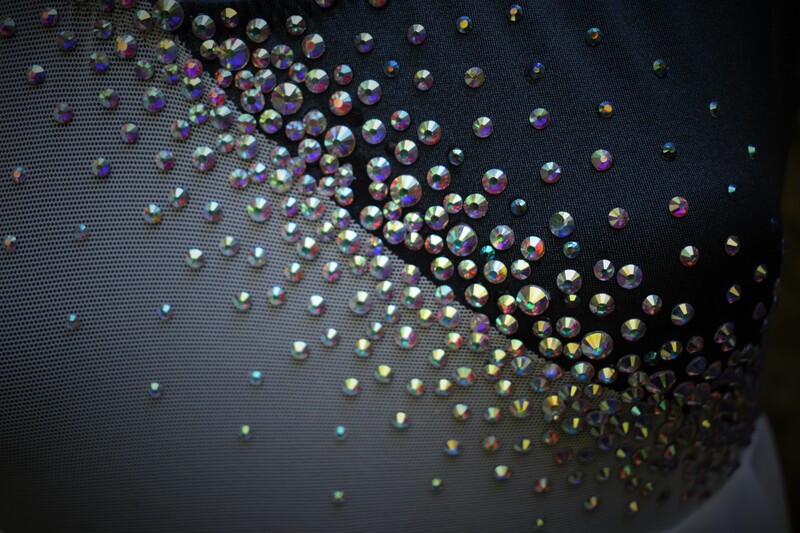 The 2 colour bodice was heavily stoned using a combination of ss30, ss20, ss16 and ss10 crystal AB rhinestones. I started with a central line of stones and then worked outwards making a random pattern that diffused towards the edges with the smallest stones. This costume was adapted from one of my favourite Kwiksew pattern KS 2601 which is now unfortunately out of print. It’s so adaptable and the deep back is beautiful. I do like making costumes like this that are just a little off-trend. There’s nothing like feeling a little special backstage with a costume that doesn’t look like a catalogue piece. On a recent trip to Indonesia, my brother brought home some bright new lace for me. While it wasn’t quite what I might use on a tutu it did pique the interest of one of my clients for a new contemporary costume. The lace itself was a greenish turquoise but it blended beautifully with the royal blue lycra. On the back here I have sewn additional appliques across the top of the gathered lace and onto the waistband. 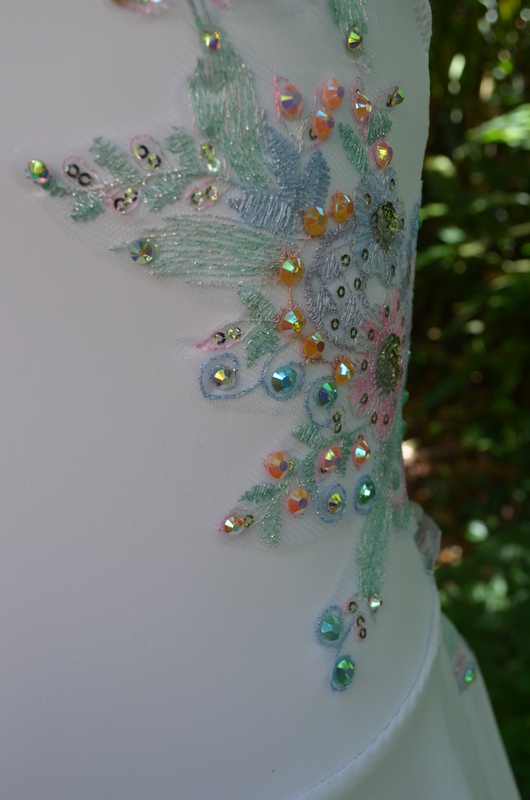 I decorated the crop top with appliques and rhinestones.